Hooray something new came out to buy? Yeah, that's it... Hooray. 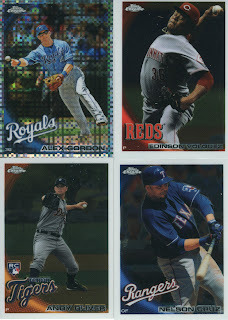 I had a gift card for Target and since I had heard a rumor about 2010 Topps Chrome blasters ringing up for $17.99 instead of $19.99, I figured I would take a ride and see if there were any left. As luck would (not) have it, there was one lonely blaster left. I grabbed a blaster and 4 packs and left knowing I would be sorry I wasted my gift card on 12 cards and a potential box of air. 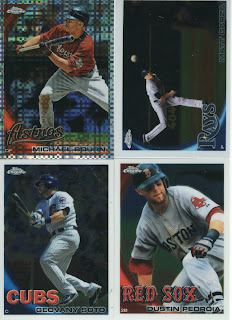 I only opened the packs so far because I was so busy finishing schoolwork due Tuesday. 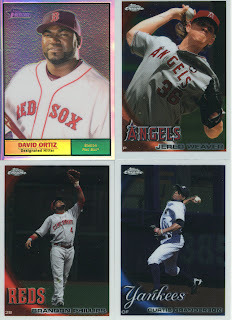 I will post the contents of the blaster later tonight or tomorrow morning. 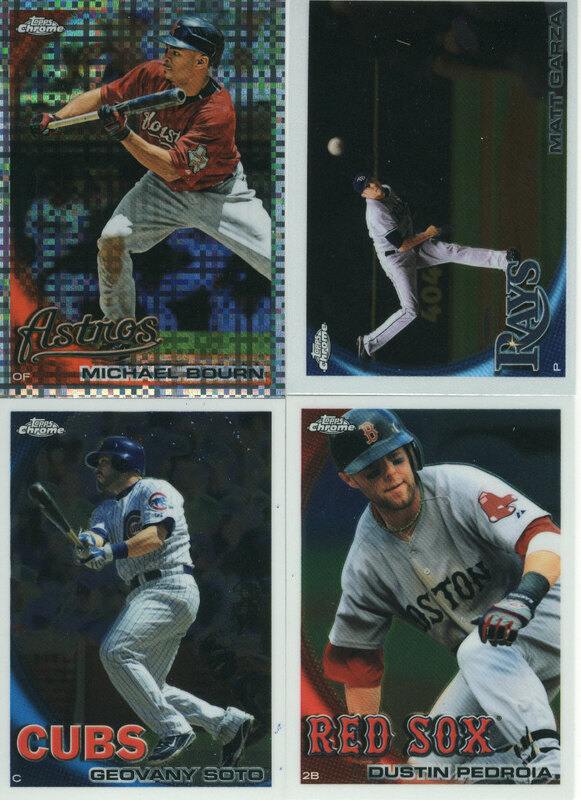 One thing to note about the retail version of 2010 Topps Chrome baseball is that the cards seem to have the same centering problem as 2010 Bowman chrome inserts did, they are terrible. The plus side is that it seems that they used better stock to print the photos on. 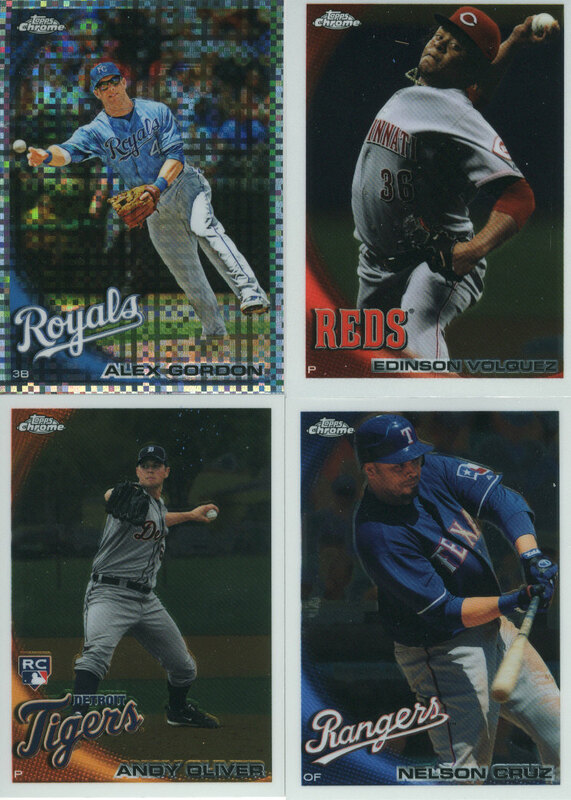 I also noticed the back of the cards feel kind of waxy, if that makes sense. Other than that, I kind of just bought some of this product to check it out and open something. Along with the centering problem I noticed a number of my Topps Chrome baseball cards have indentations along the front, it looks like they got caught in a roller. Don't worry you'll need that roller again to roll them back out after the curl up. 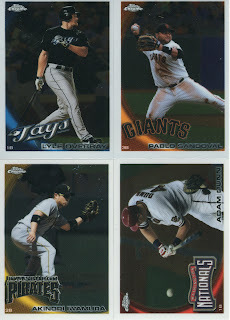 Are the photos on the Topps Chrome cards the same as the photos on the regular Topps cards? If so, why? 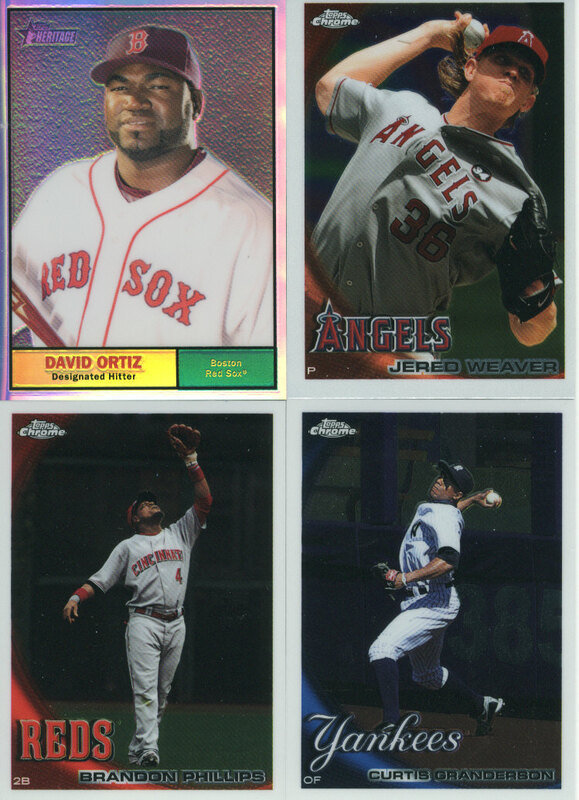 I would be much more inclined to by Topps Chrome if I was getting a different looking card than the regular Topps cards I already have. Any thoughts?